Dedicated to providing comprehensive diagnosis and treatment in virtually every medical and surgical specialty to those in need, the Mayo Clinic continues to be the #1 medical facility and research center in the nation, and in the top five in the world. Employing over 3,400 physicians, scientists and researchers, the Mayo Clinic is a pioneer and innovator in today's medicine. Visitors travel from all around the globe to come to this famed medical center and health complex for treatment, education, research, lectures, and the best medical care around. Whether you're a patient, a medical provider, nurse, doctor, or student, the Mayo Clinic Health System in Rochester, MN is there for you. Directly connected to the Mayo Clinic, the Towers at the Kahler Grand Hotel, grants the best access to the hospital. View our specials. What are some good restaurants close to the Mayo Clinic? Located right inside The Towers at the Kahler Grand, try three of the best restaurants in town. For an upscale dinner, feast at Lord Essex The Steakhouse, and enjoy the renaissance inspired atmosphere along with creative culinary creations. Grand Grill offers a casual option near the Mayo Clinic, with home-style favorites for breakfast, lunch, and dinner. Stop in Martini’s for a light lunch and over 60 different types of your favorite vodka or gin drink. There are plenty of other dining options all around the medical complex including Jimmy John's, serving signature overstuffed sandwiches, and Caribou Coffee, as well as dining at the Grand Shops of Kahler located on street level. Where can I park when I visit the Mayo Clinic? The Towers at the Kahler Grand offers both self and valet parking to all guests during their stay. 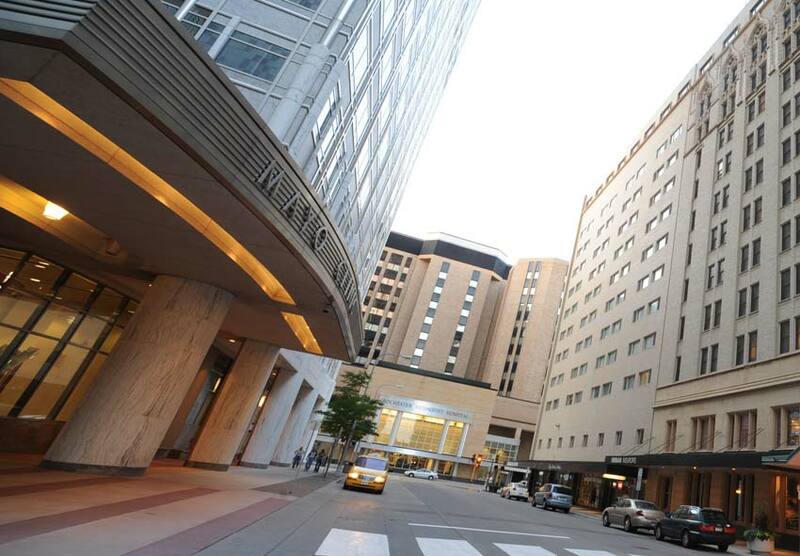 Park at the hotel and get direct access to the Mayo Clinic via the climate-controlled pedestrian skyway or underground concourse. There are parking garages at the clinic itself or valet services at several different ramps around the medical facility. This is just a test Comment, Thank you for your Support.